Picture: Ellis Achong Karker. 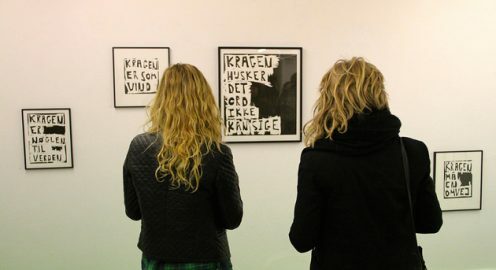 06.02.2015: Opening: Svend-Allan Sørensen: Grafik og Gevær @ Specta. Linda was a student of mine in the academic year 2014 and her purpose was to rethink the graphic media, which, for her is heavily influenced by surfing and street environment. Sub-culture in general. Baum works primarily figuratively and textually. I’ve only seen Linda Baum work very unconventionally. She has , for example, used minestrone soup for printing. Why? Because it’s what surfers eat when they’re on the go. As an artist, Linda Baum represents the subcultures therefore she uses the materials related to them.